Club Penguin Cheats by Mimo777 Club Penguin Cheats by Mimo777: 2010 Club Penguin Cheats for March/April Furniture Catalog! 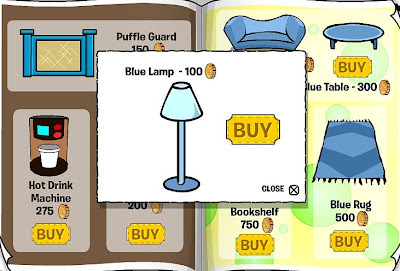 2010 Club Penguin Cheats for March/April Furniture Catalog! Step 5. Click on the tree stump. 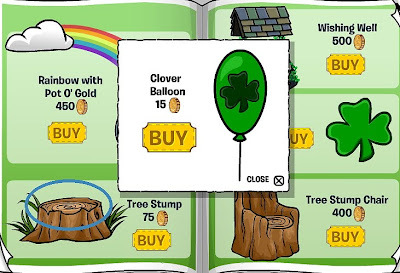 You have now found the Clover Balloon cheat! Step 6: Stay on the same page. Step 7: Click on the stone on the Wishing Well. Step 7: Go to page 2. Step 8: Click on the mailbox. Step 9. Click on the 4th page of the catalog. Step 10. Click on the ski thingies. Now you have found the Snowboard Rack. Step 12: Click on the Stone Couch. You have now found the Portal Box! Step 13. Stay on page 5 in the catalog. Step 14. Click on the Stone Lamp. 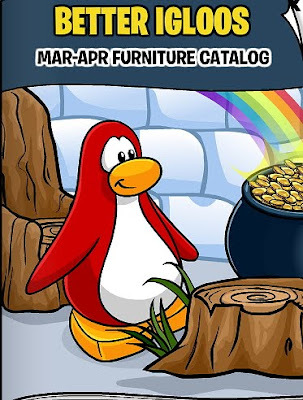 You have now found all the cheats in the March/April Furniture Catalog! Sweet! 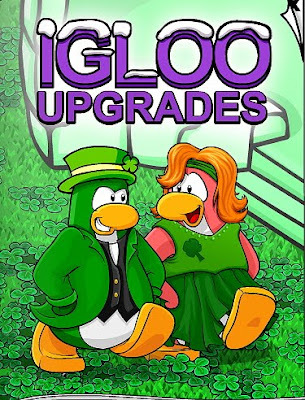 CHECK OUT THE NEW GREEN CLOVER IGLOO! Ive got the Clover Igggy mimo! Its awesum and I reccomend it to EVERYONE! Yeah the St. Patricks stuff is awesome. Yup! My cousin's birthday is on St. Patty's Day! I'm crying cuz I'm not a member but I want all the St.Patty's day stuff. I'm a big Ireland fan. *cry cry* I need a membership card or something. *cry cry* Why must Clubpenguin torture me?!?! Ha ha! That igloo looks like one of those rainbow puffles from Youtube! I can see everyone's getting ready for St. Patrick's Day!! I hope the party will be as good as the previous ones!! I can still remember taking part in that HUMONGOUS green parade, that started from... er, I forgot, oh well... and went all over the Club Penguin island!! EVERYONE - remember to turn green on St. Patrick's Day! Green's my fav colour (that's how you spell color in the UK) by the way. What's yours? can see everyone's getting ready for St. Patrick's Day!! Greens my favourite colour too! In the UK we spell 'color' with a u so it's colour. I wasn't playing CP this time last year so I hope it's as good as it sounds! 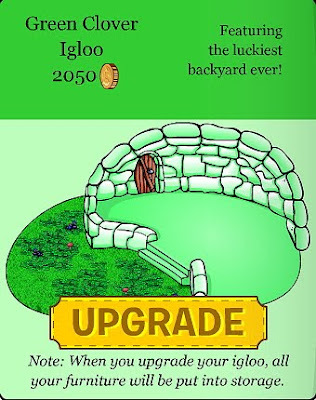 they accidently made the new igloo 2050 coins instead of 2500 everyone hurry hurry hurry! Say happy birthday for me! Lol, I think they will still subtract 2500 coins from your account but it just says 2050, or you could've possibly read it wrong. kirst300 again i also found a top hat go to the 5th page and glick on the pile of coffe cups, also on that page is a dazzleing blue top hat click on the water.On page 11 click on the snowmans nose and you will get the pink snorkel, also on that page you click on the mountain top to get flippers. 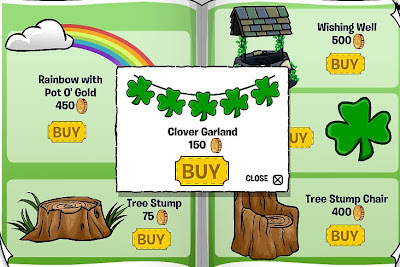 Yeah, I bought a lot of the St.Patrick's Day igloo furniture. It is awesome! I'm part Irish, so I can't wait for my parents to make a Corned-Beef and Cabbage dinner on the 17th. Happy Saint Patrick's Day! My garland cheat does not work MIMO. What happened???? I'll be needing some of that catalog stuffs... if only i had membership... Does anyone have a membership code i could borrow? Happy pre-birthday to you ppl with near st. patrick's day birthdays. Happy st. patrick's day to everyone! She didn't get it wrong!! it only took 2050 from me so i'd be quick before they find it!! !